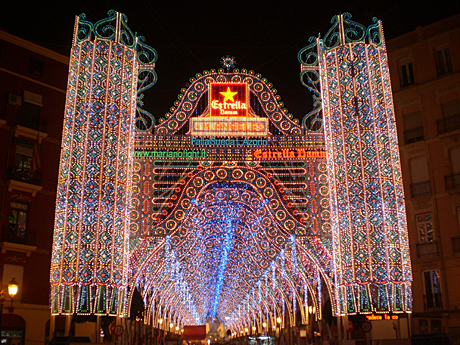 Part of Fallas is the annual competition of lights, and traditionally Calle Sueca in Russafa carries off the prize. It’s not hard to see why. 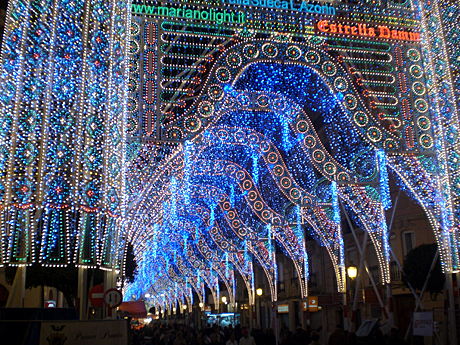 While most streets in Valencia content themselves with modest and tasteful strings of lights, Sueca really goes over the top. Think: Chevy Chase in Christmas Vacation. It’s beautiful, though, even if I wouldn’t want to live there. Apparently, there’s an annual battle between the lights’ organizers and the street’s residents (who, strangely, don’t seem to be the same people). Looks like the organizers won this year. The us airlines should be offering cheap airline tickets at least once a season. In this way at least a good chunk of travel-related concerns are taken care of. Then airlines like the mesa airlines keep introducing discount packages. Bigger groups like the mexicana airlines should also be doing this. i attended the fallas a few years ago, and i must say it was one of the most fantastic spectacles i have ever witnessed. I read that the streetlight displays begin a few days before Fallas. Do you know when the displays will start this year? We walked by Sueca today and asked one of the Falleros (was awfully grumpy) and he said they are going to turn on the lights on the 7th at 9pm. We will be there? Who else?